The National Weather Service is predicting a transition to snow and freezing temperatures by Wednesday night. Consider moving your horses tomorrow if they are in standing water that is likely to freeze. This is a great time to network with neighbors with barns, or whose property may be on Higher Ground with better drainage, and may be able to house your horses temporarily. One of you asked me to post recommendations for horse care in upcoming cold weather. Here's how it works: hay fills the hind gut (cecum and colon) where it absorbs LOTS of water and is slowly digested. A byproduct of the chemical processes of hind gut digestion is HEAT, which keeps your horse warm from the inside out while digestion provides energy to your horse. If your water is very cold or frozen, your horse's consumtion drops and they are predisposed to develop cecal or colonic impaction. An impaction is simply the accumulation of dehydrated food material within the colon. This material is difficult for the colon to move, so it slows down the transit of food material, creating a back up that can progress to colonic distension or even a complete obstruction, either of which will cause pain and colic. If your hay is too high in poorly digestible fiber, the same thing can happen even in the presence of adequate water intake. People mistakenly think that feeding grain is a good idea in the winter because it is more calorie-dense. This thinking is faulty. Grain is digested primarily in the small intestine (foregut) where it draws large amounts of water out of your horse's circulation. The digestive process is relatively fast and provides little Heat. And also causes large transient fluxes in fluid balance and gastrointestinal motility. Does any of that sound like what you want to be happening in your horses gut in very cold weather? However, some geriatric horses and high-level Performance Horses are unable to obtain adequate calories from hay alone. Supplemental concentrate rations are best fed as wet mashes, no matter what the ingredients. This is a significant inconvenience in the winter, but is very important. 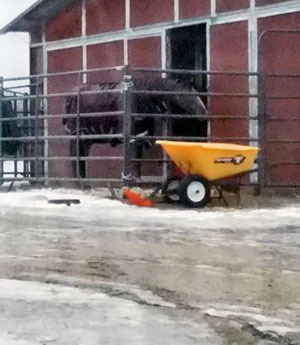 It is ok to add 1 Tbsp of table salt to mashes to encourage water consumption, but it really is not necessary if you have invested in a safe method to heat your horse's water and your hay is high quality. Finally, don't forget exercise! For you and your horse, winter tends to make us all more sedentary. Not good for anyone's health, horse or human.